So today I'm going to share with you one of my very favorite lunches EVER! 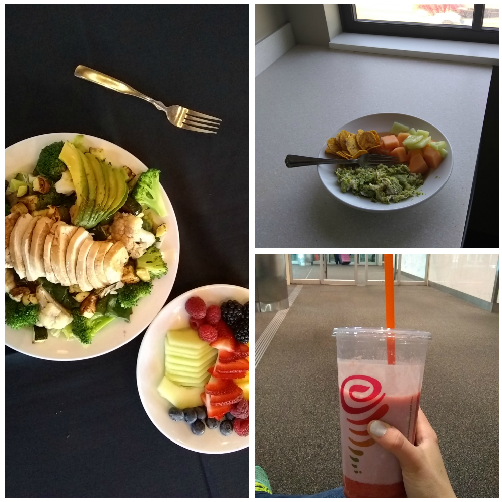 AIP, Paleo, or normal-ish eating habits. This is one of my favorites, hands down, across the board! There are days when it’s a good day only because you didn’t throw up. There are days when it takes all the strength you can muster to stay on your feet. And if you’re stupid like me, you’ll add a thousand things on top of that. I apologize for my prolonged absence. It happens when you have a chronic illness. I’ve been a lot worse ever since coming from YCCLC, and had friends visiting and a summer arts festival. So there has been a lot keeping me away from here! Most days I can stay on my feet, thankfully, but I’ve had some pretty terrible days, while being in town every day for at least three weeks straight. I had to eliminate every food I was eating, and add a few things back in a little at a time. Unfortunately, some days all I can eat without being sick is the worst food ever invented, bone broth. 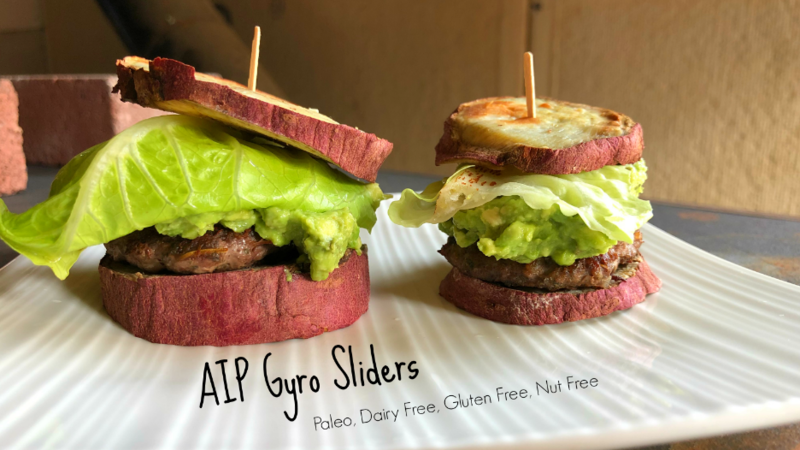 But on days I feel okay, I can still have my all-time favorite food, these AIP gyro sliders! Besides the bone broth, lamb is the only protein that I can have. But that’s fine, because I LOVE lamb. Growing up on Israeli food, I got to eat it quite often. 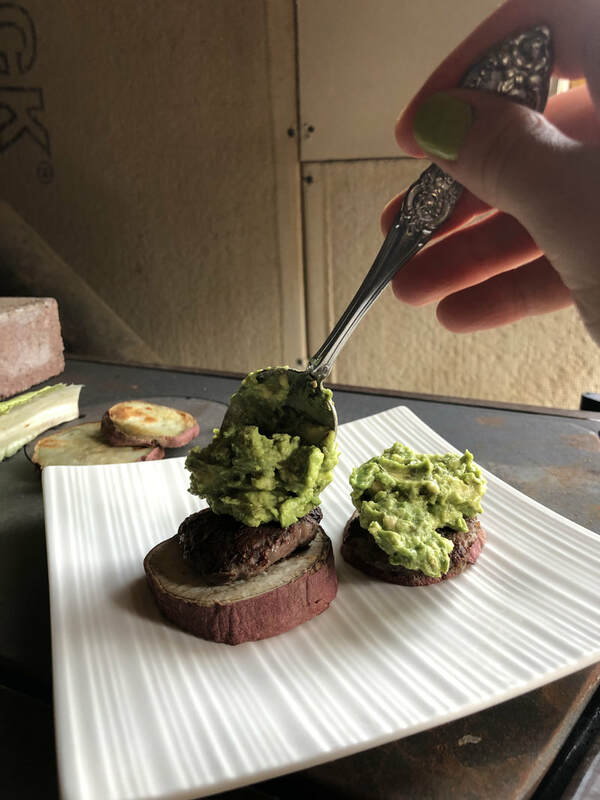 These sliders are on a sweet potato bun with an AIP guac and lettuce. They are full of Mediterranean flavor, and they are my absolute favorite lunch! Someone asked me the other day if I was tired of these yet, because I have them so often, but no. I still can eat this almost every day! Heat the oven to 425*. Slice the sweet potato into ¼ inch slices and bake until soft. Let cool. Mix the lamb and the first list of spices. Divide the lamb into sixteen patties. Freeze twelve. Cook four of the patties. While they cook, mix the avocado and the second list of spices. 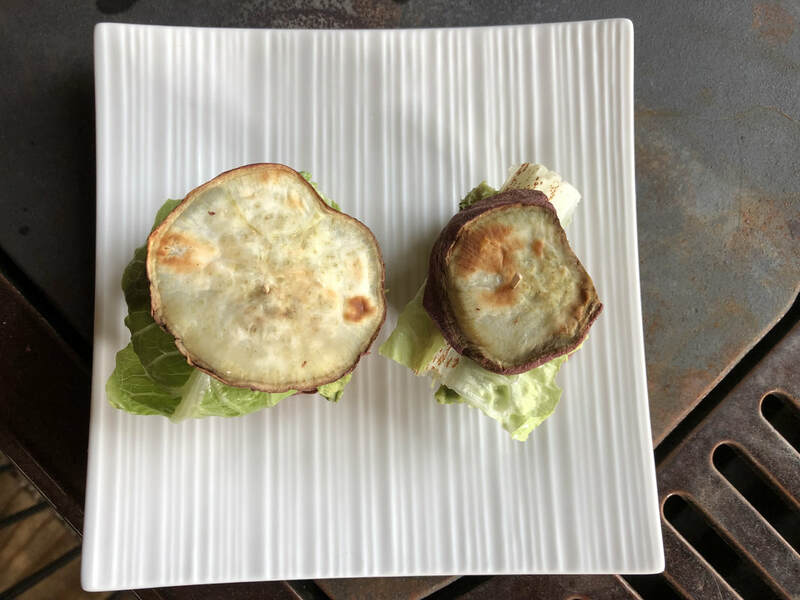 Place patties on sweet potato slices. Top with guac and lettuce. Finish with another sweet potato slice. Well, I’ve done it! I have officially been on the Autoimmune Protocol for almost three weeks. I’m just starting to feel the benefits – I have more energy and ability to do things, even though I’m still tired, and one of the biggest pluses is that I can read harder things and for longer amounts of time! When college algebra starts clicking in my brain, then we’ll really know it’s working, hey? I probably consume too much fruit, but I’m trying to survive mentally as well as physically, so whatever. One of the hardest things, though, has been no chocolate. I mean, it’s kind of essential to my well-being! 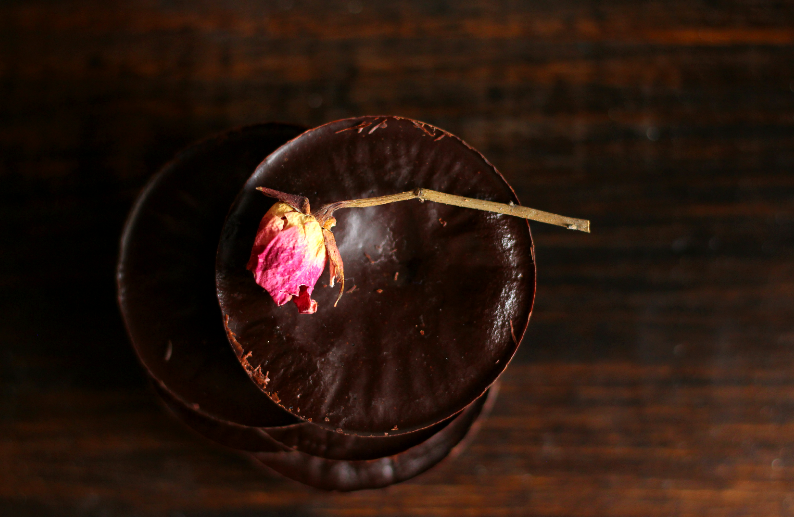 I’ve found a few ideas that use carob instead of cacao, and I think I’m starting to get the hang of making things more chocolate-y. Or my taste buds are forgetting what real chocolate tastes like. Isn’t it funny how that happens? When you can’t have things, you forget what the real versions of those foods taste like, and it gets easier to eat the fake stuff. Eventually, you stop craving the foods you can’t have. Most of the time. Those fries smelled really good the other day, though. 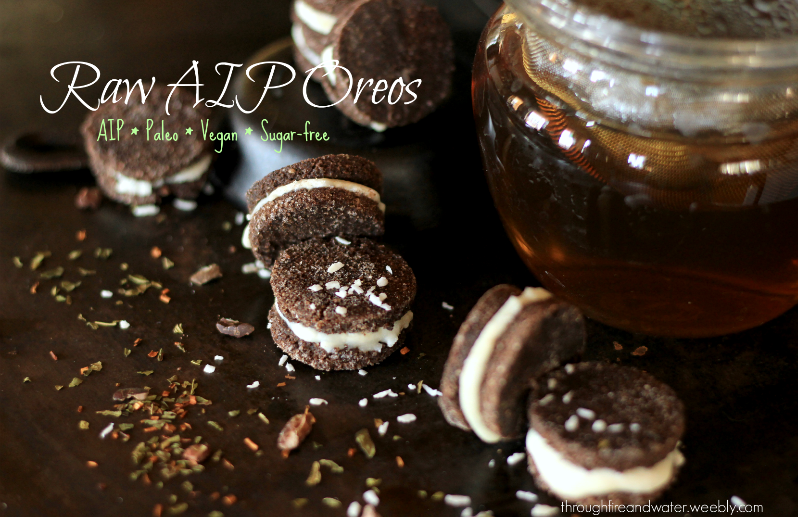 These oreo copy-cats were inspired by Minimalist Baker’s raw, vegan oreos. When I made that recipe, I was thinking ahead to AIP. I played with the recipe in my head, and decided that I could make an AIP version without too much trouble! The first go was amazing! It turned out a little too coconut oily for my taste, though. Well, in between my first two batches of these, I made some really amazing carob chips based off of a recipe that used palm shortening instead of coconut oil. It was amazing, and something that I hadn’t thought of before! Palm shortening usually makes me think of that cheap ‘buttercream’ on storebought cakes that is just soooo disgusting. In this recipe, the amount of fat you use is up to you. Less fat makes significantly less, and tends to crumble, but the flavor is a lot richer. I would make an amount somewhere in the middle. Place all ingredients except coconut butter in blender/food processor and process until completely combined. Pry each piece up. Spread with about 1/2 t. coconut butter and place second cookie on top. Repeat until all cookies are filled. Let dough warm up and re-use. Enjoy with a cup of Sipping Streams Tea Company's Northern Serenity. 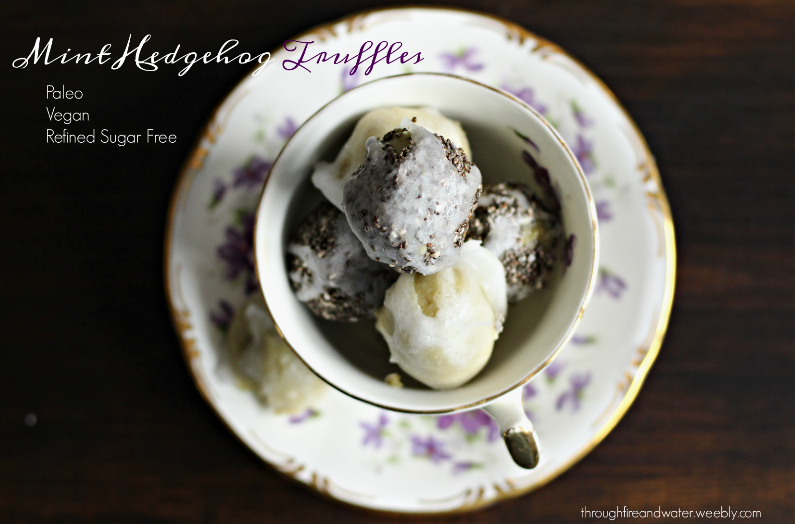 So I have a bit of an obsession with hedgehogs… and I love chia, and I wanted to make my mint truffles a little more truffle-y. These happened! One of the recipes that’s been on my allergy Pinterest board for a long time has been these Avocado Mint Meltaways. Mostly because they were intriguing and minty and had chocolate. But for some reason, I wasn’t content with just following a recipe. Go figure. I wanted them to have more substance than the original recipe, because when I snack, it’s not usually for a light snack, but for substance. And I decided not to coat them in chocolate, because – let’s face it – I’ve been going through our cocoa powder waaaay too fast. Oh, the pictures. The teacup was a 13th birthday present from friends, and it’s still my favorite. It makes me think about springtime and violets and light swirly clothes and perfect temperatures! And we’re back to that time of year! The spring breezes are even affecting us up here, and, though I looooove winter, I’m getting excited about spring! These go perfectly with the weather, though. I like the fresh, cold taste of the mint and xylitol combined with the pretty pastel green. It’s kind of like meltoff running through a mossy creek bed… or maybe I’m just weird in my mind. This was my first time playing with melting xylitol, and I want to try to make actual candy with it sometime. I melted it and then drizzled it over the top of the truffles. What recipes remind you of spring? Blend all ingredients except chia and extra xylitol. Pour into medium bowl. Roll 1 1/2½ t. at a time into balls and then roll in chia seeds. Freeze on baking sheet lined with parchment paper. 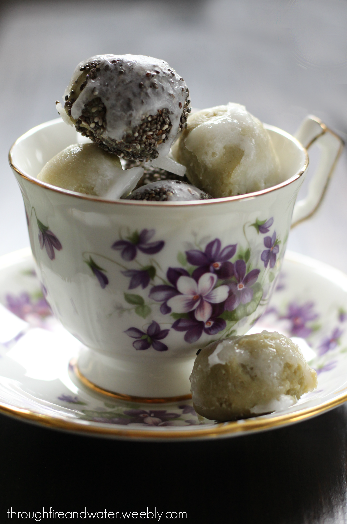 Melt xylitol, and drizzle over frozen truffles. Freeze. Once candy is hardened, transfer to storage container and store in fridge. We’re heading out to the west Yukon River for a week, so the blog will be quiet for a bit (now that I've gotten into a bit of a routine with it!) Before I go, though, I have another delicious meal for you. One of my very favorite food blogs is MinimalistBaker.com – check it out, her food is AH-MAZ-ING and easy! A recent post of hers that landed in my inbox was this Spicy Korean Cauliflower Wing recipe. That one didn’t take long to make it to the table! But I had to reformulate the gochujang sauce recipe into something that I can eat. At that point, it probably wasn’t even recognizable as gochujang, but it was GOOD. The whole recipe was amazing, in fact, and my family is begging to have it again! The sauce in the recipe was obviously going to be quite spicy, which is not up the alley of everyone in my family, so I backed off on the red pepper and used chili powder. The result is a fairly sweet sauce with a nice umami background and a bit of a kick. This sauce, is indeed amazing. 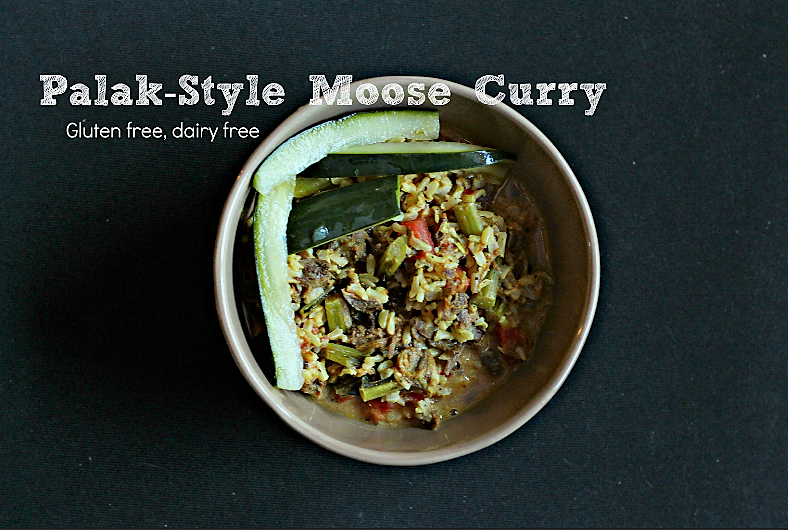 We had some leftover REALLY GOOD moose round roast that I used for this, but you could use any meat you choose. Just make sure it’s tasty. Or omit meat entirely for a vegan meal. It also makes a really good, easy lunch to pack. 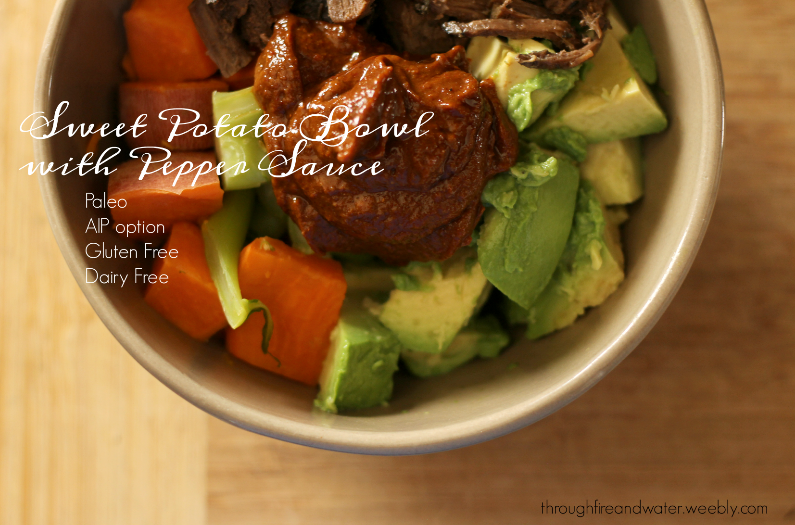 I steamed a whole sweet potato and all our leftover broccoli for this, and of course you have your half avocado. It’s as good cold as it is hot, so you don’t even have to corrupt it with microwaves! If you have a family who tries to steal your limited-diet food on a regular basis like mine does, you may want to make extras of this recipe. I had to fight hard to keep this one to myself! 1. Steam sweet potatoes and broccoli for 10 minutes. 2. While vegetables are steaming, add all sauce ingredients to a blender and blend until smooth. 3. Place steamed vegetables into bowl. 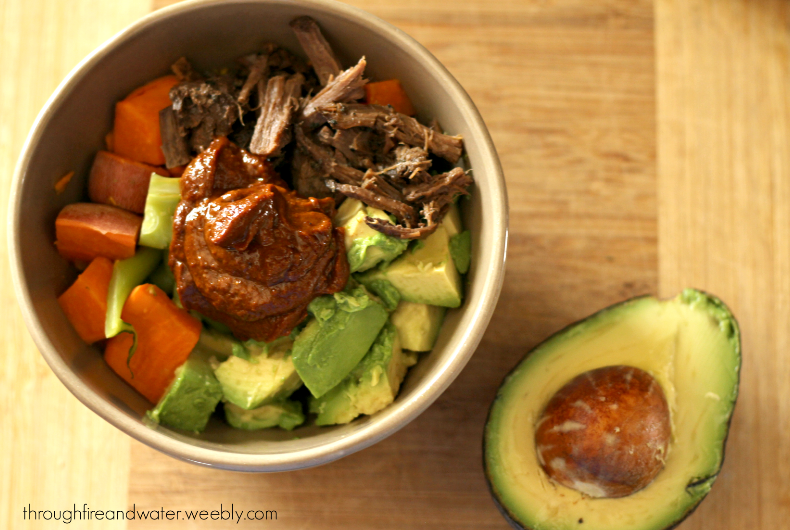 Slice avocado and add to bowl. Add meat, then place sauce on top. I had a different post I was planning to publish this week, but a couple of days ago, my sister mentioned Pi Day was coming up. Nerd me went, “Oh, yeah, how’d I forget that?” Of course, the answer is easy – I forget everything. In 2017, we only picked about a gallon of wild blueberries. It was a very sad year of blueberry harvest. We have picked up to seventeen gallons in a couple of days. So these are very special blueberries, and we had saved them for a very special treat. This recipe is based off of one that we’ve used for a long time – one that converted me to liking goat milk, in fact. One of my favorite variations included a meringue on top and roasted macadamia nuts nuts underneath the crème layer. This was one of the very first recipes that I began working on converting when I began my limited diet. In other words, it’s good. Funny things, holidays. We almost never do stuff for holidays besides the Big Four. Like, when did we start celebrating Pi Day? And then we have St. Patrick’s Day coming up. How did that even become a thing? Much less a national holiday? 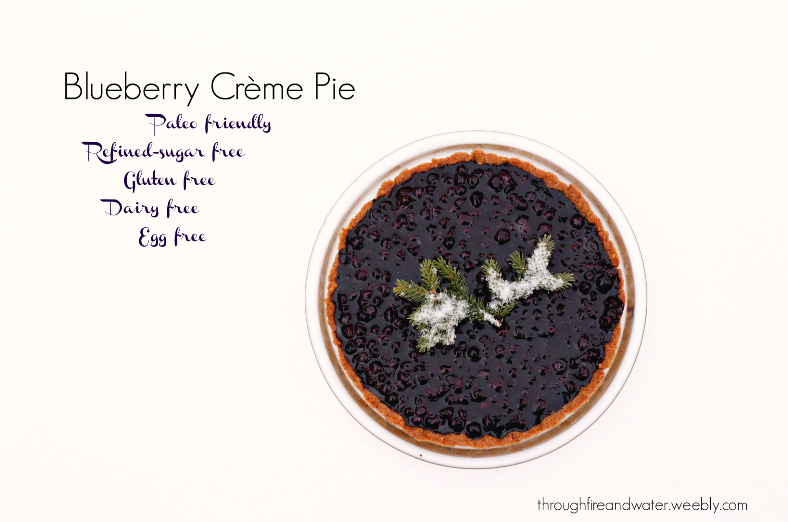 Anyways, blueberry crème pie. The crème layer is best when made with a sweeter, milder dairy-free milk like coconut or almond. If you use flax or cashew like I did (the only milks the allergy duo in our house can both have), I strongly recommend adding the stevia to the crème. It will help cover up the slightly stronger flavor. It definitely has a light, spring-y, happy flavor – but the warm temperatures have once again disappeared, and the snow is falling again. We are at 72 inches and counting! I love the snow – it’s so beautiful, and it blows my mind that the fact that every. Single. Snowflake. Is different! All of that six feet of snow out the back window, spreading across thousands of square miles, and every snowflake is unique! What an amazing Creator I serve! 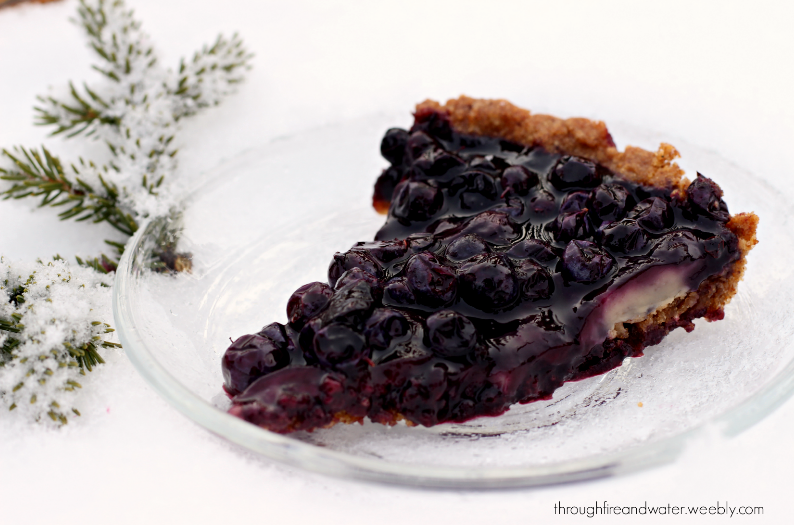 Back to the pie: it is paleo, refined sugar free, dairy free, and easy! Have fun! 2. Place dry ingredients in dry carafe of blender or food processor. Grind into a smooth paste, then transfer to a medium bowl. 3. Add coconut sugar to gelatin egg, and then add the mixture to your nut paste. Thoroughly mix. 4. Press into pie plate. Poke the crust with a fork, then bake for 15 minutes. This is the only use of the oven, so you can turn it off. Let cool to room temperature. 1. In a small pot, whisk milk, arrowroot, and coconut sugar constantly over low heat until it begins to thicken. Turn off heat and continue to whisk until it becomes custard-y. 2. Once thickened, add vanilla and stevia, if desired. Cool to room temperature. 1. Mix all ingredients in medium pot. Simmer while stirring until thickened. Let cool to room temperature. 1. Spread crème evenly in pie shell. Sprinkle with tapioca or arrowroot starch. This helps the layers stay distinct. 2. Spread blueberries over top, gently. Viola! 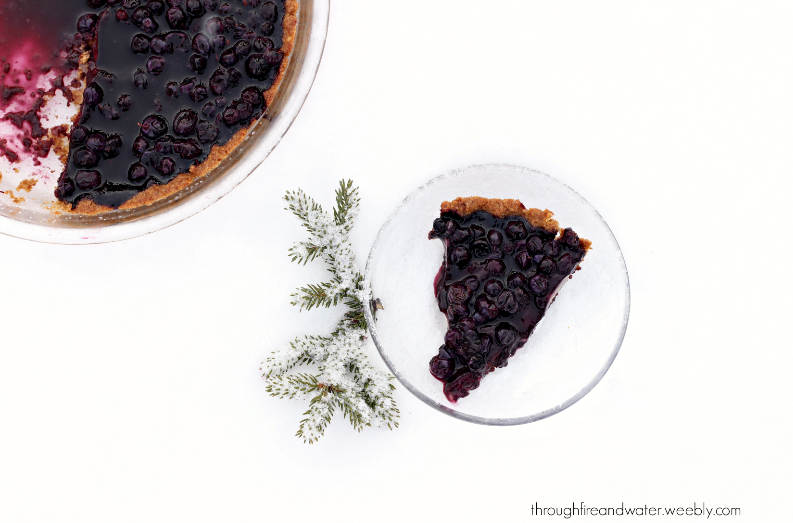 You have made a blueberry crème pie! Store in the fridge, preferably uncovered to avoid condensation. For the record, the circumference of my pie is approximately 24 inches. Hi everyone, I’m back! I would apologize profusely for my absence, but as it was caused by myriads of auditions and other school deadlines, I feel slightly justified. But it has been stressful! And for this girl who is not supposed to be stressed (hahahaha) it hasn’t helped with my health at all. Physical or mental. I can’t just buy chocolate. If it’s something I can actually have, it’s going to be expensive. And I mean EXPENSIVE. Like over $5 for a 2-oz. bar. It’s ridiculous. I messed around with making chocolate with cacao butter, since often coconut oil chocolate will make me feel kind of sick. But cacao butter is expensive. And at the rate that I was consuming chocolate the last couple of weeks, that just wasn’t fair when I wasn’t the one actually buying the butter. And if I was, I wouldn't be making it. So it was back to the coconut oil. 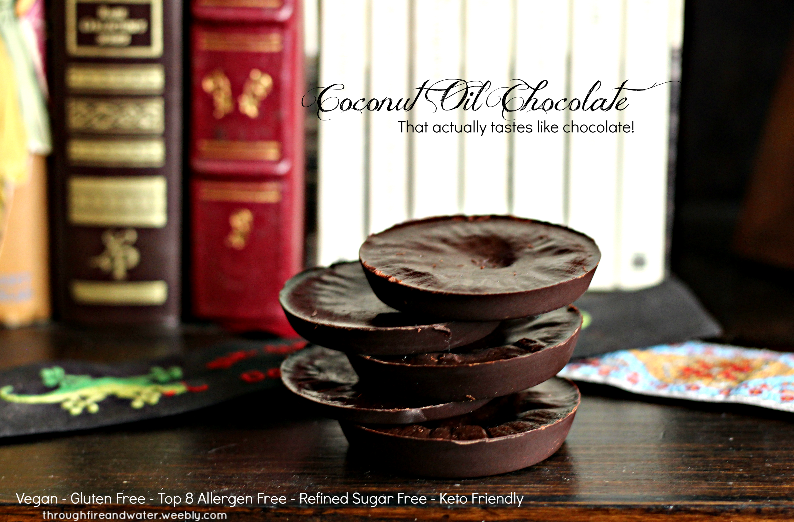 I spent a couple of tries on it, but finally figured out a recipe that 1. doesn’t taste much like coconut and more just like normal chocolate (if you’re really sensitive to coconut flavor, don’t quote me on this one) 2. doesn’t make me feel sick! and 3. has no artificial sweetener. Winning all around on this one! Oh, the espresso? Growing up in a family where gourmet desserts are the norm, I learned early on that coffee in small amounts brings out the chocolate flavor without adding any of its own! I figured that would probably help my flavor problem out – and it did. This, sadly, is NOT AIP. Which is bad, because we’re talking about putting me on AIP. So I’ll start messing with that next. Always love a challenge! Well, when I feel up to it. Melt coconut oil. 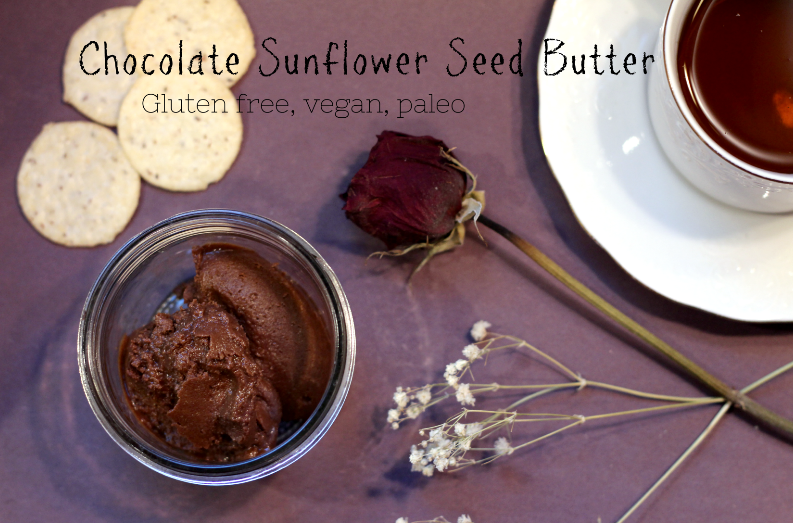 Whisk in cocoa and carob powders until smooth. Add vanilla and espresso powder. Pour into mold (I used a silicone muffin tin). Let cool. I just leave mine outside, since it's well below freezing. You could just put it in the fridge, if you have one! And then go sit down somewhere and take a moment to breathe and enjoy it. A good book always helps with that! This year, my extended family spent Christmas at my grandparents’ house. Christmas is always a hard time of year for my diet, because I want to eat all those wonderful gourmet foods that my mom has been preparing for years and years. But put me in a place where other family members are preparing the food and I’m a good four hour drive from the nearest ingredients that I might be able to use to make some good copycats and… I’m going to have problems. 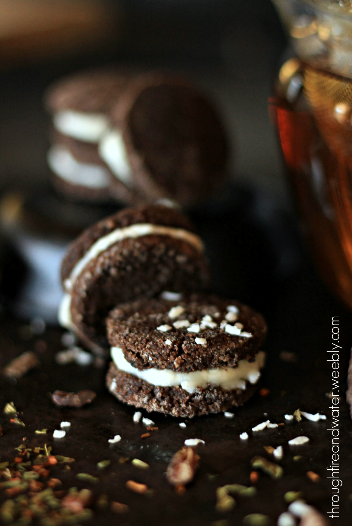 One of my favorite Christmas cookies that Grandma makes has always been her anise cookies. As I was sitting there moping about not being able to eat that initial tray of gluteny cookies and chemical-and-sugar-laden chocolates, Mom suggested that I try I make something I could eat. At this point, it would be good to mention that this was the day after an 18-hour drive, and I was more than exhausted and not in a good mood. In other words, I was just trying to make everything harder on myself. But I took out my limited stash of ingredients that had arrived from Vitacost, and sat down to figure out what I could make. A couple pounds of flour. Check. Chia seeds. Check. Gelatin. Check. Xylitol, coconut sugar, maple syrup. Check. We had some palm shortening, and of course basic things like baking powder and salt. Grandma had some extracts. Oookay. Mom and I talked through making cookies. Apparently it’s a 4:2:1 ratio of flour, sugar, and fat typically. So I dove in and followed that. 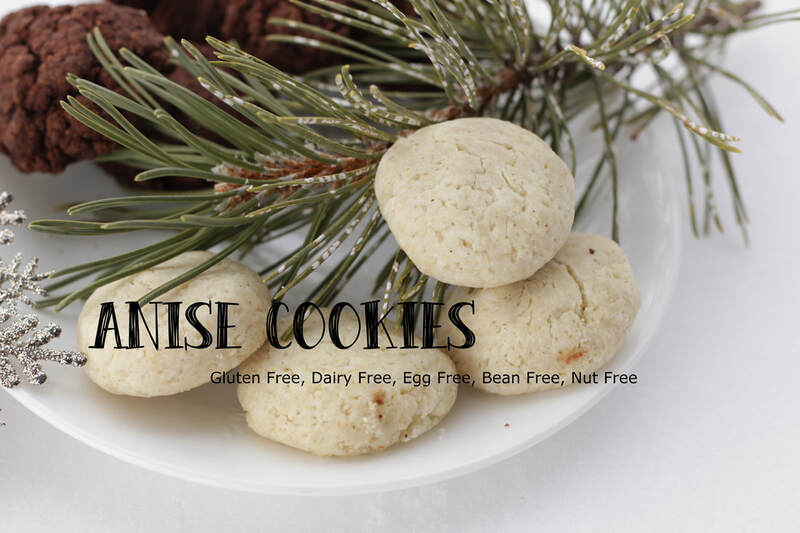 As I looked through the various flavorings I had, I decided to do the anise cookies. Super simple and taste really good. 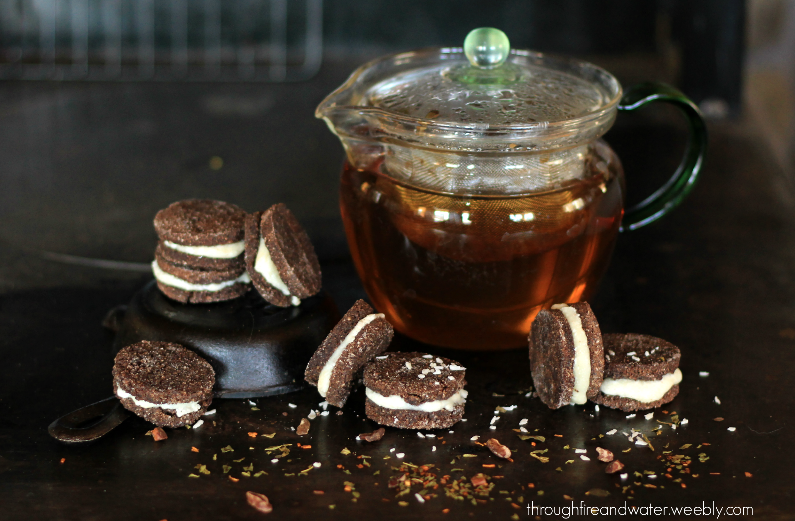 Okay, I want them to look as pretty as real anise cookies. So I decided to use xylitol as my sweetener, since it wouldn’t add any ugly brown color to the cream-colored cookies. They turned out delicious! They’re a little more dense than the typical anise cookies, but the flavor and texture was overall very nice. I was glad to add a little of our traditional Christmas to my limited menu for those days. Note: Make sure that your 1-to-1 gluten free flour has xanthan gum in it. If not, you'll need to add 1/4 t. of xanthan gum. In a small bowl, whisk together your flour, baking powder, and salt. In a medium bowl, cream palm shortening and xylitol. Add anise extract. Mix dry ingredients into the wet, 1/3 c. at a time. Add water 1 tablespoon at a time until dough feels similar to silly putty when you roll it. Cover baking sheet in parchment paper and roll dough into pecan-sized balls. Place 1 1/2 in. apart. Bake for 10-12 minutes, or until mostly firm to the touch. Let cool, or eat warm!